Your Imperial Assault missions bring you directly into the Star Wars™ universe. Whether you struggle to uncover a dastardly plot to destroy the Rebellion, or battle head-to-head against a single opponent, you can expand both your campaigns and your skirmishes with seven new Ally Packs and Villain Packs! Iconic heroes and villains stride into your missions with these Ally Packs and Villain Packs. If you fight for the forces of the Rebel Alliance, you may harness the cunning wiles of Han Solo or the massive strength and loyalty of Chewbacca. Alternatively, you can hold a strong position with the Rebel Troopers or destroy your opponent’s defenses with the Rebel Saboteurs. The dark side gains equally powerful new figures from these figure packs. General Weiss and the Royal Guard Champion pledge their destructive power to the Empire, while the infamous bounty hunter IG-88 can help you overthrow the tyranny of the biologicals. Each Ally Pack and Villain Pack includes detailed plastic figures as well as new Deployment, Reward, Agenda, and Command cards for your games of Imperial Assault. What’s more, each figure pack contains a new side mission that can be included in any campaign, and two new skirmish missions that use the same map, expanding your options for Star Wars adventure. Read below to learn more about the destructive power of the Rebel Saboteurs, and pick up your Imperial Assault Ally Packs and Villain Packs today at your local retailer! The Rebel Alliance fights against unimaginable odds. The Empire holds countless star systems in its grasp, and it has the material to manufacture thousands of warships and weapons every day. For the Rebel Alliance to ever achieve victory, they need some way to combat this power. Thankfully, the Rebellion has some members with a special talent for explosive solutions who can ensure that a key factory suffers unaccountable setbacks or a prototype starship never reaches development. 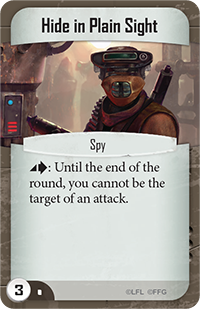 The normal version of the Rebel Saboteurs was included in the Imperial Assault core set, and the Rebel Saboteurs Ally Pack introduces their elite Deployment card . For two more points, elite Rebel Saboteurs offer several advantages over their less-equipped comrades – elite Rebel Saboteurs have more health alongside improved surge abilities, and another powerful attack option. All Rebel Saboteurs offer a passive accuracy boost that affects any attack they make, allowing them to shoot further than their dice would typically allow. In addition to this, they also feature an arsenal of different surge abilities. A Rebel Saboteur can spend surges to stun his opponent, to pierce an enemy’s armor, or to cause a deadly explosion and deal blast damage to a cluster of hostile figures. Each of these surge abilities becomes more dangerous with the Rebel Saboteurs Overload ability. This ability invites you to trigger the same surge ability up to twice per attack. Of course, your opponent may choose to shield his most important objectives or figures behind a shield of disposable troopers. That’s where the Priority Target ability enters play. 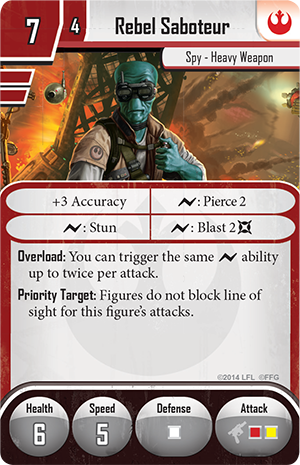 With this ability, figures cannot block your elite Rebel Saboteurs’ line of sight, allowing the Saboteurs to ensure that every attack hits home. In your campaigns, the Rebel Saboteurs can be an invaluable asset if you’re attempting to bring down a key figure or destroy an Imperial emplacement. Overload allows you to quickly bore through enemy armor by triggering Pierce 2 twice per attack. You can also spend a surge to stun a hostile figure and keep it from fleeing your attacks. Because the Rebel Saboteurs are so effective at destruction, they also free your heroes to use their actions for other tasks, rather than merely focusing on pouring damage into a specific target. The Rebel Saboteurs can also prove crucial in your skirmish missions. When you battle a strike team with large amounts of figures, such as Troopers, you can use the Rebel Saboteurs to thin the ranks. One of the most potent applications of the Overload ability is in conjunction with the elite Rebel Saboteurs’ Blast 2 surge ability. With Overload, you can trigger Blast 2 twice, dealing four additional damage to every figure adjacent to your target, and quickly mowing down clustered enemy units. 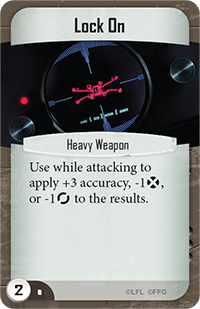 The Command cards in this Ally Pack help your Spy and Heavy Weapon figures make even more of an impression on a skirmish mission. 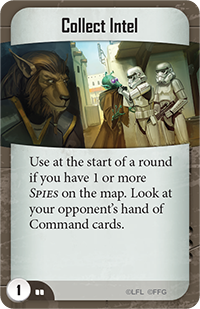 When you need to know what your opponent has in store, Collect Intel can allow you to look at your opponent’s hand of Command cards, giving you vital information for future turns. On the other hand, you may simply want to ensure that a particular unit survives to make his attacck. Hide in Plain Sight keeps one of your Spy figures from being targeted by an attack until the end of the round, allowing him to accomplish his mission unhindered. Lock On is another tool for keeping an attack from missing. With this Command card, you can add accuracy or remove your opponent’s dodge or evade result, keeping your opponent from escaping your clutches. The Galactic Civil War rages across the galaxy, growing larger day by day. 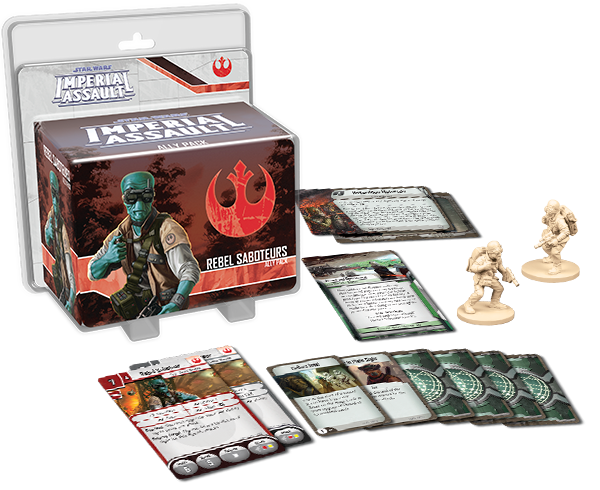 Now, new Ally Packs and Villain Packs for Imperial Assault bring you more fully into this war with every game. 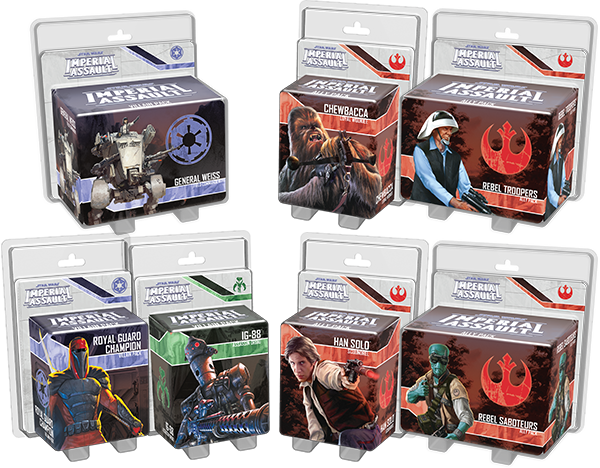 Head to your local retailer and pick up your Imperial Assault figure packs today!